Ferns are wonderful structural plants which are ideal in a woodland garden, a damp border or to grow at the edge of a pond. The varieties offered are fully hardy and thrive in humus-rich, moist but well drained neutral to slightly acid soil, in dappled or partial shade. 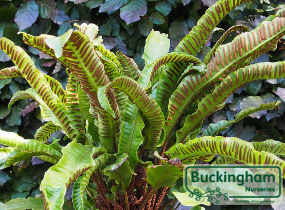 Evergreen fern with strap-shaped, leathery, bright green, 16 inch (40cm) long glossy fronds which are heart-shaped at the base, often with wavy margins. This fern prefers lime in the soil and will be less luxuriant in acid conditions. Must be in shade or semi-shade. Height 1-2ft (30-60cm), spread 10-20ins (25-50cm).